The current sewage systems in the Netherlands do not have sufficient capacity to transport the increasing amount of waste water. Next to that, the purification of waste water is increasingly expensive and complicated. 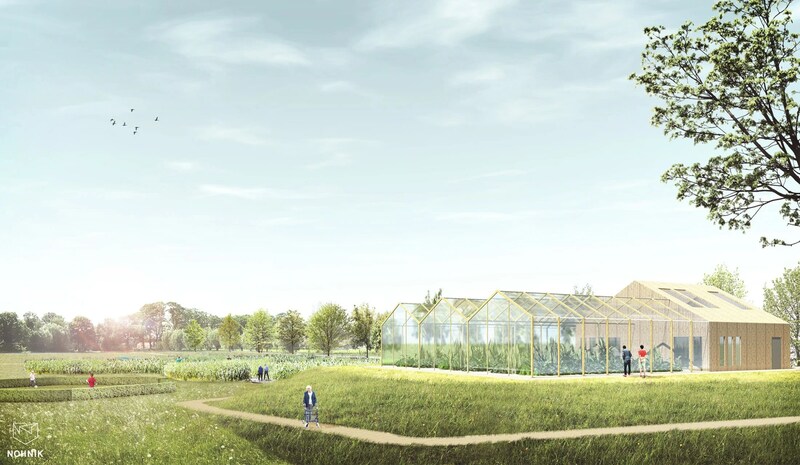 In the village of ‘De Glind’, the Vallei en Veluwe Water Authority, the municipalities of Barneveld and Leusden, and the Rudolphstichting collaborate to build the first botanical waste water treatment facility in the Netherlands. This botanical greenhouse is a system in which bacteria colonies on the plant’s roots purify waste water in a fully natural way. Next to the greenhouse several helophyte filters and water basins are linked to this system. In the process of natural purification of waste water opportunities arise for extracting resources out of the waste water and to remove residues of medication from the water. 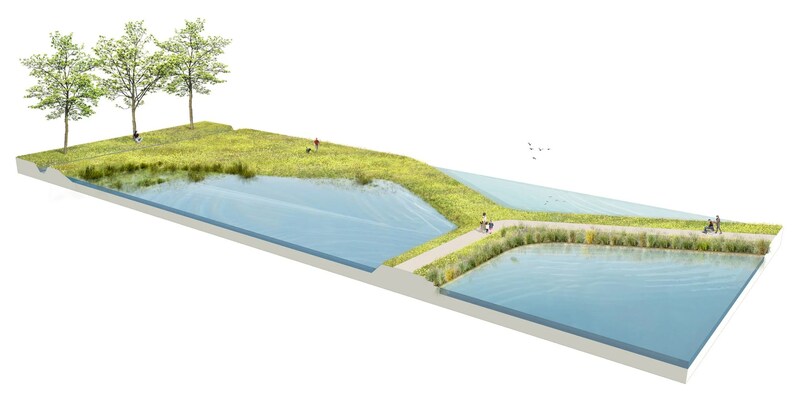 As the size of this system of waste water treatment is quite large, its design and integration within the existing landscapes asks for an integral and well-thought out vision. We interpreted the integration of the greenhouse system in the landscape as a design challenge to create a Waste Water Treatment Park. 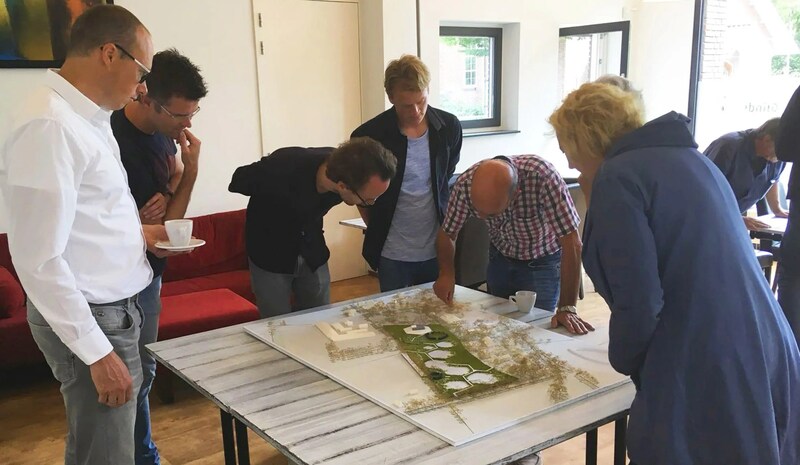 Within a participative design process the plan for the park was developed, based on input of local stakeholders. 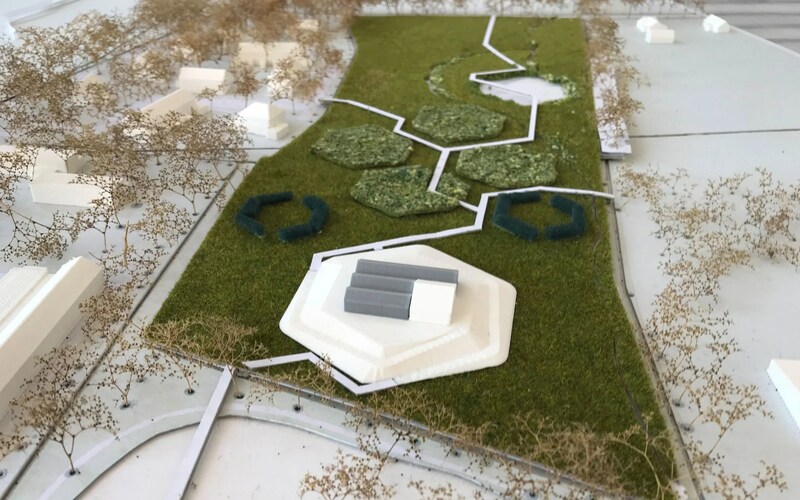 The plan includes a design for both the botanical greenhouse and the helophyte filters and water basins. 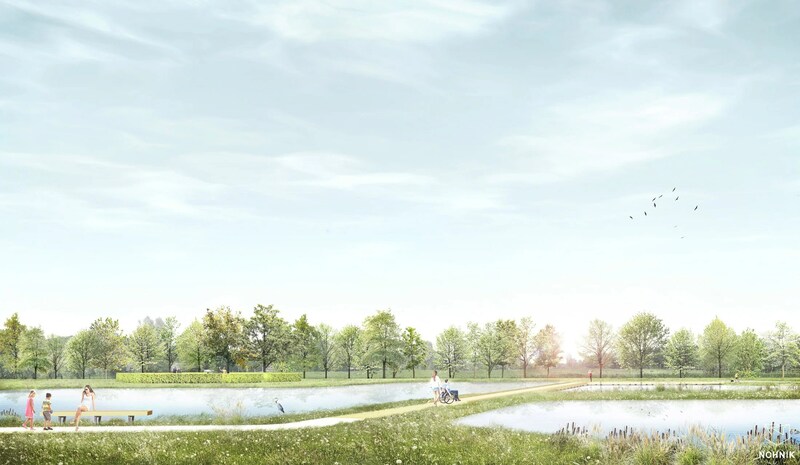 Next to the technical aspects an important incentive for the design is to create a valuable park landscape for the village and its inhabitants. By this, the park offers both an innovative way of waste water treatment as well as great opportunities for recreation, ecology and education. Based on reference studies and a model different design for the park were tested. 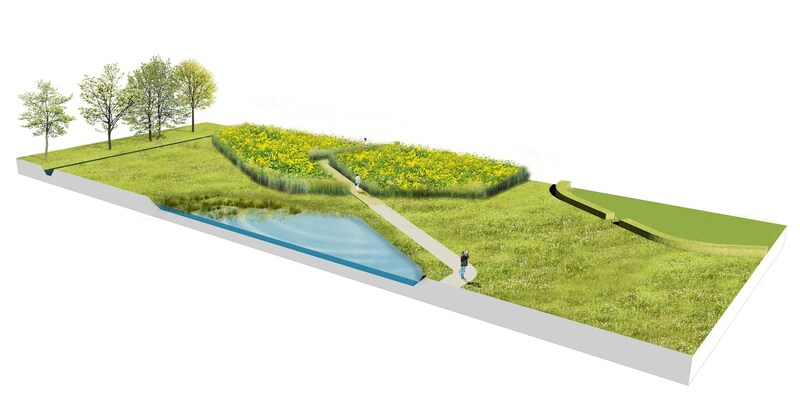 A basic condition in this is to restore the framework of old planting structures of the so-called ‘kampen landscape’. 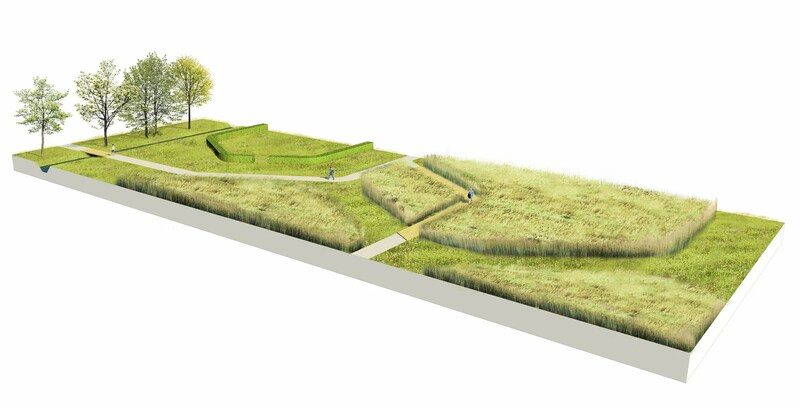 Rows of trees and hedges form a clear boundary for the site and help to strengthen the green mosaic structure of the landscape. 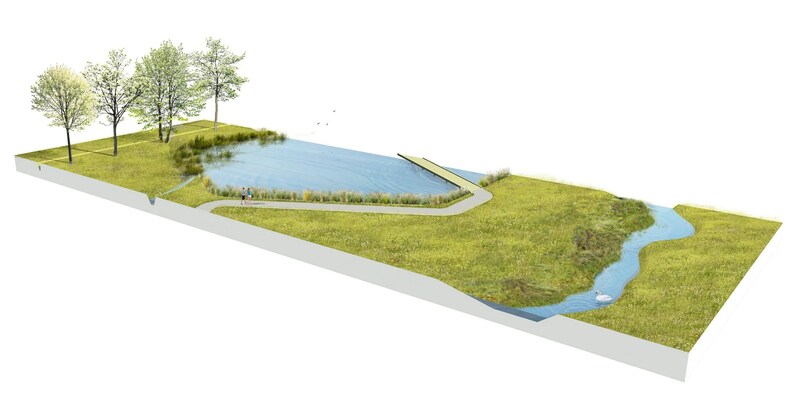 In the design of the treatment system itself a balance between an efficient use of space versus offering an attractive park landscape to its visitors was studied. 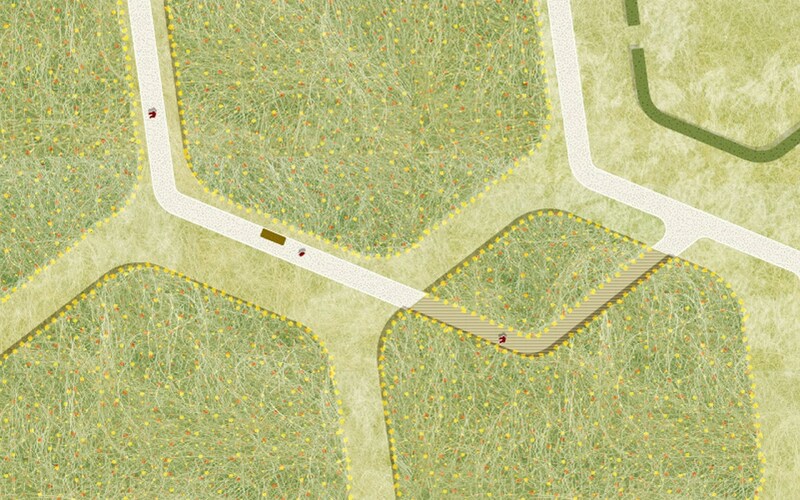 The park is structured by a pattern of honeycomb shapes. These kind of shapes are known for their efficient ratio of the surface versus the length of the edges of a cell. By combining cells of different sizes a diverse pattern arises. In this pattern all parts of the waste water treatment system can be integrated. As a result of the differences in scale of the honeycomb cells, the space in between the cells have different shapes and sizes. These ‘left-overs’ provide interesting opportunities for integrating ‘park programme’ such as viewing platforms, allotment gardens, a picknick spot etc. Local inhabitant are invited to submit initiatives and ideas for further developing this park programme. 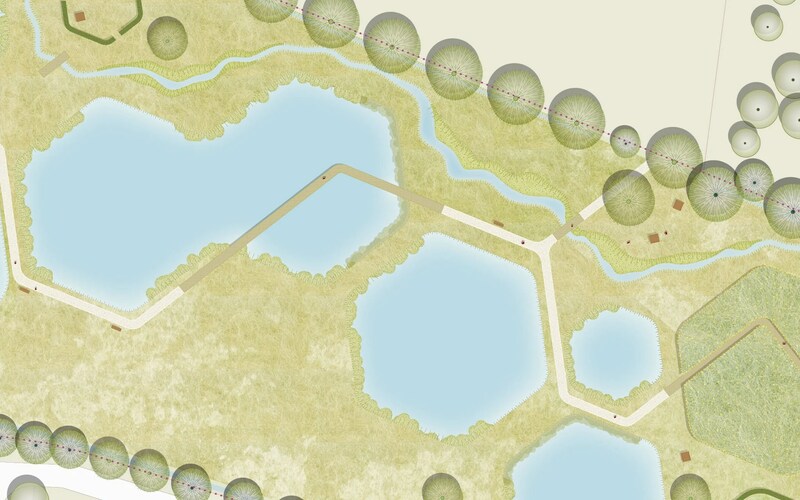 The recreational areas in the park and the different parts of the treatment system are connected by an attractive path system. 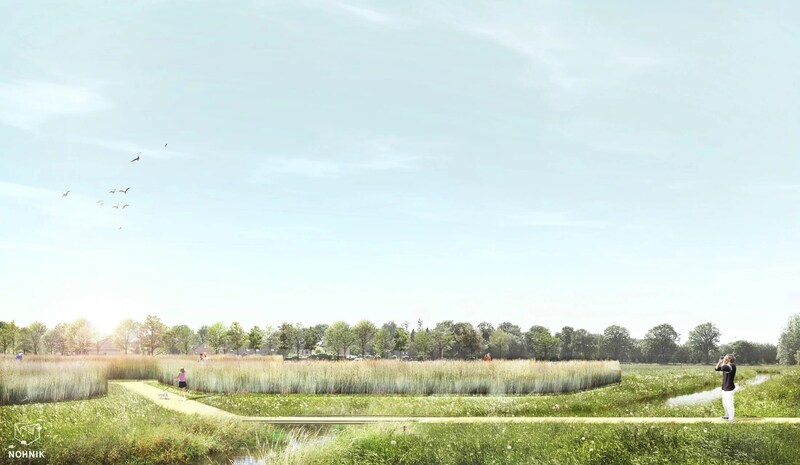 The differences in scale within the honeycomb structure build up a pattern that responds to the diverse parcelling and varied directions of the planting structures in the existing mosaic of the ‘kampen landscape’. Next to that the honeycomb structure has been made diverse by offering different types of planting and different designs for the edges of the cells and their embankments. The meandering natural brook that is reintroduced to the site forms a contrast to the honeycomb structure. As well principles are developed for the architectural design of the greenhouse.